The blog at VintageVixen.com, where we sell vintage clothing & accessories. Join us in our love of all things vintage! This vintage advertisement from 1979 filled in its history a bit. It was indeed an Indian import, but its presence on the pages of a popular magazine is what must've made it a big seller in the late 70s. 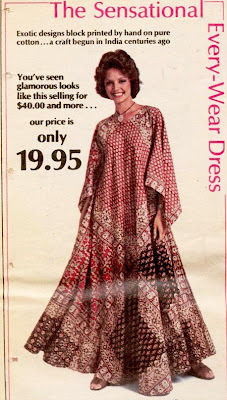 The original ad says this dress is "free-flowing, easy-going fashion that's so zingy, so terrific to wear... every hour, every chance you get!" Pretty cool that it was an authentic block print. Notice the vintage price of $19.95, too... in today's dollars this dress would be $64.33! Where can I buy this hippie dress? Blog owned and maintained by Vintage Vixen Clothing LLC. Simple theme. Powered by Blogger.